Some 400 years ago, reverend Stephen Hales measured the blood pressure of a horse by using a vertical glass tube. Luckily, the techniques in interventional cardiology to measure blood, coronary and cardiac pressures have improved immensely. In the circulatory system, force is transmitted through the fluid medium as a pressure wave, which is a periodic fluctuation in force per unit area. The manometer was one of the first pressure measuring devices with a rubber tambour coupled with a writing device recording changes in pressure. The fundamental frequency is the number of waves per second (in Hz). In a heart frequency of 120/min, the frequency is 2. Harmonics are the reproductions of the fundamental frequency, for 2 Hz the first 3 harmonics are 2, 4 and 6. The sensitivity is the ratio of the amplitude of the recorded signal compared to the input signal. The natural frequency is the frequency in which the membrane will oscillate after a stimulus. This frequency will naturally be damped, diminishing the amplitude of the pressure curve as well as the frequency. In a physiological pressure curve a frequency respons of 10 times the fundamental frequency is good (10 harmonics). Next to highest natural frequency (by using a short, stiff catheters with few coupling elements and without air entrapment), there has to be optimal damping of the pressure measuring device. Many laboratories have a system in which a fluid-filled catheter is attached by means of a manifold to a pressure transducer. A silicon diaphragm serves as sensing element, and fluid pressure is transmitted to this element through a medium gel. Referencing the pressure to zero, is important. 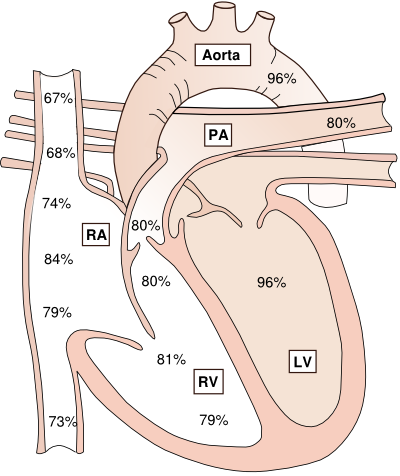 Midchest level is widely used as zero reference, but taking into account hydrostatic forces of the blood in aorta and left ventricle, the best position for this is the left sterna border in the fourth intercostals space. Pressure measurements are best performed after expiration, when breath is held, to prevent interference due to pressure changes of normal thoracic excursions during respiration. Small air bubbles in the system can cause damping and lowering of the natural frequency. High-frequency components of the pressure wave form can cause ventricular pressure ”overshoot”. Motion of the tip of the catheter accelerates the fluid contained within the catheter, producing a superimposed wave of 10mmHg. These are particular common in pulmonary arteries. Flowing blood has kinetic energy by its motion, therefore an end-hole catheter pointing upstream records a pressure that is artifactually elevated by kinetic enery, adding a pressure from 2 – 10 mmHg. A catheter impact artefact happens when the fluid-filled catheter is hit by valves or by the walls of the ventricular chamber. This is common when pigtail catheters in the left ventricular chamber may be hit by the mitral valve leaflets opening in early diastole. Cardiac output is the amount of blood per time unit ejected by a cardiac chamber. It is the product of stroke volume and heart frequency. It can be estimated on the basis of various assumptions. The two most commonly used methods are the Fick method and the thermodilution method. For comparison among patients, the cardiac index is used, a correction of cardiac output for the patient body surface area. The thermodilution technique requires an injection of saline in the proximal end of a catheter, while measuring the temperature in the distal end of a catheter. The cardiac output is related to the area under a thermodilution curve, considering the temperature and specific gravity of the fluids in the proximal and distal ends of the catheter. The thermodilution method tends to overestimate the cardiac output in patients with low outputs (<2.5L/min). Cardiac output measured by Fick method uses the the oxygen consumption and the arteriovenous concentration difference. It assumes that the rate at which oxygen is consumed is a function of the blood flow and the rate of oxygen pick-up by the red blood cells. Oxygen consumption can be measured by a polarographic method or it can be assumed on the basis of the patient’s body surface area. The arteriovenous oxygen difference can be determined on the basis of blood sampling from catheters in the left ventricle and the pulmonary artery. The saturation difference can then be multiplied by the hemoglobin concentration (mg/dL) and the constant of oxygen- carrying capacity of hemoglobin in mL/O2/g Hb. A schematic illustration of this flow measurement is shown in figure 1. Fluid with a certain oxygen concentration enters the system at flow rate Q, while O2 is added at rate V, raising the oxygen concentration (Cout). 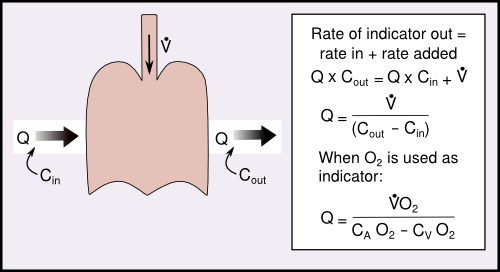 The rate of the indicator QxCout must equal the QxCin, plus the rate at which O2 is added. The blood flow is then the rate at which oxygen is added (oxygen consumption) divided by the difference in oxygen content of in this case the arterial and mixed venous system. A cardiac shunt is an abnormal blood flow in the circulatory system. Normally, pulmonary blood flow equals systemic blood flow. A shunt can be right to left (from pulmonary circulation to systemic circulation), left to right or bidirectional. A intracardiac shunt can be detected and localized by using blood samples with measurement of the oxygen saturation at different sites within and close to the heart, the so-called “oximetry run”. This run obtains blood samples from all right-sided locations, including the SVC, IVC, right atrium, right ventricle, and pulmonary artery. Figure 1 and 2 show an example of an oximetry run in patients with atrial en ventricular septal defects. 'Oximetry run' in a patient with atrial septal defect. The 'step-up' detected in the right atrium (RA) identifies a left-to-right shunt at this location. 'Oximetry run' in a patient with ventricular septal defect. The 'step-up' detected in the right ventricle (RV) identifies a left-to-right shunt at this location. A shunt can also be quantified. This is based on measurement of pulmonary (Qp in L/min) and systemic cardiac output (Qs in L/min). The shunt is then measured by the flow ratio Qp/Qs. A ratio < 1.5 indicates a small left to right shunt, and a ratio of 1.5-2.0 a moderate-size shunt. A ratio of 2.0 or more indicates a large left to right shunt and generally requires percutaneous or surgical repair to prevent pulmonary or RV complications. A flow ratio of less than 1.0 indicates a net right to left shunt. This page was last modified on 11 December 2016, at 19:22.